One of the things Dr Sanna Kaisa Spoof has researched in her academic career is the cultural history of genealogy and family associations. Dr Spoof's own interest in genealogy began at the age of fourteen. She remembers a school trip to the City of Lahti library, where they were shown microfilm readers. Their guide said these were used for family history research. This opened a door into a world she had never even known existed. Dr Spoof remembers she had always been interested in bygone days, such as how her grandparents used to live. Her grandmother had a wealth of stories to share, to a rapt audience. Her genealogy hobby also led Dr Spoof to an interest in museums and to discovering ethnology. During her studies, her hobby influenced the subject of both her Master's thesis and her proseminar, where Dr Spoof was assigned Gösta Grotenfelt, Finland's first Professor of Agriculture, who had researched the history of agriculture and dairy farming and even founded a museum of agriculture. Later, working as research associate, Dr Spoof was in charge of assigning proseminar subjects to students, leading her to discover that there were also family associations in Finland. Until then there had been no serious research on family associations as a cultural phenomenon. One of her students did a proseminar paper on the arms and insignia of family associations, and at the same time they also conducted a survey on family associations. Dr Spoof's "discovery" of family associations happened to coincide with a burgeoning of family associations at the turn of the 1980s and 1990s, when family reunions were frequently held and many new associations were founded. Finnish family associations date from the 1920,s when the first family associations were established. The first associations were founded by noble families, then other upper-class Swedish-speaking families. In the 1930s these were then followed by the Finnish-speaking gentry and yeoman families. Naturally, the nobility had centuries of family tradition to fall back on, including reunions and family arms. In a young republic where nobility no longer had an official position, incorporated family associations became a way of preserving traditions. Families of commoners also adopted customs from the nobility. In addition to family coats of arms and reunions, even association bylaws were imitated, which could lead to daughters and their children being excluded from the family. Since women changed their surname on marriage, they were considered to have joined their husband's family. This surname rule was relaxed in the later decades and mostly abolished in the 1980s. Finland is often called the land of organisations, and this is also reflected in family associations, which in Finland are almost without exception registered organisations. Genealogy is popular worldwide, but its registered form is peculiarly Finnish. Being a registered association does have its benefits for reunions, as the responsibility and expenses don’t fall on any one person. Dr Spoof was herself a long-term board member of the Toikander-Hohti Family Association but stepped down as its chair in Autumn 2015. Most recently she has been promoting networking between family associations in the Kymenlaakso region. 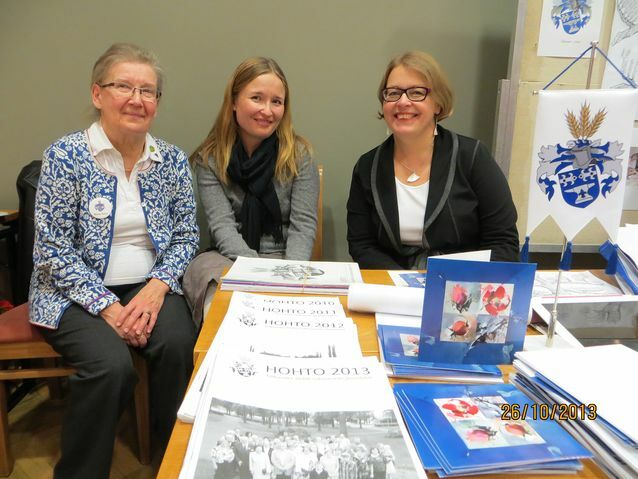 Board members of the Toikander-Hohti Family Association presenting their association at a genealogy convention in Kotka, October 2013. Photo: Collection Sanna Kaisa Spoof.